I know some of you probably subscribe to Sephora Beauty Insider (Sephora US Online Store newsletter) and get jealous over all the online deals. Then, there came the question "Why don't we have it in Malaysia?". Well, the misery ends when Zalora announced that they're bringing Sephora on their e-commerce site. 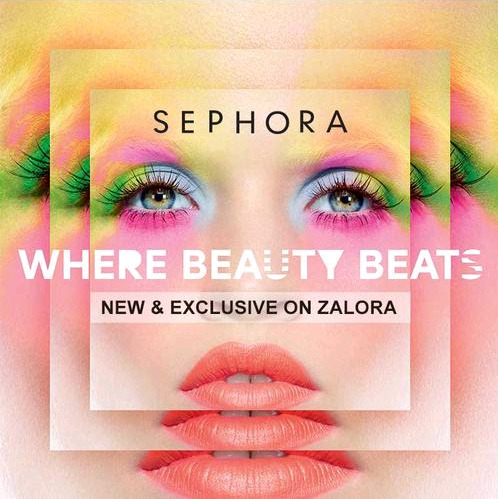 Now you can shop for Sephora products on Zalora. We are all familiar with Zalora's convenience, they ship to anywhere within Malaysia (when I get stuck in the jungle for 3 months, Zalora was the best pal I ever had #truestory). I see a lot of gains in this service in terms of Zalora's shipping and Sephora products are now easily available. However, the sad side is, Zalora only carries Sephora homebrand. They don't carry consignment brands from Zalora such as Urban Decay, Tarte, etc. Go to Zalora's page to browse all the products available and see if there's anything you would like to get. And if you LIKE my facebook page <<here>>, send me a message and I will give you 20% discount code from Zalora.